A guest post by Kelly Estes from Hot Cookin’. What would it be like to eat bland food every day? It wouldn’t be fun. It sure wouldn’t be enjoyable! But eating bland food for a while could happen to those ill-prepared for a disaster, especially if supplies were difficult to procure. Thinking about what kind of spices and oils are important to have on hand for survival cooking, there are a few that would be on my ‘must have’ list. 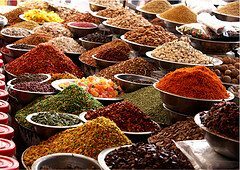 Now, you may wonder why you’d want such a vast array of spices and seasonings. The reason is it could get boring very quickly eating the same thing over and over. Spices Like Fashion? With spices and seasonings, you can mix and match, like with outfits. If you wear the same red shirt day in and out, you’ll soon tire of it (and so will others). But if you have a vest or blazer to wear over the red shirt, or a different color shirt, or different shoes, you’re creating a different look. Variety is Key We humans tire of eating the same thing day in and day out. You don’t want to eat pork roast all week. But if there’s a good sale on pork, you can have the roast with sweet potatoes one day, then serve it with brown rice, homemade applesauce and brown gravy the next day, and mix it up by serving a pork and vegetable stir fry the following day. So, prep your pantry with some good ingredients and spices. Your family will be very grateful you did. Pricey Spices Remember in the olden days, when spices were very, very expensive? So pricey that only royalty and nobles could afford spices? Even salt was dear and hard to get. Yes, spices can get expensive. But, if you order in bulk and split the spices and shipping cost among spice-ordering friends, your wallet won’t hurt as much. These are things to think about when prepping for any kind of disaster; whether it’s a hurricane or worse. So, how is your pantry looking? Are you prepared? Or do you need to spice things up still?